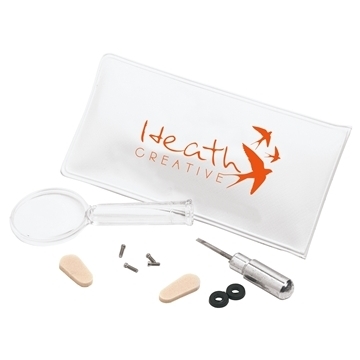 Mini fix-it kit for eye glasses includes many components that you will need for quick and easy emergency repairs. Compact carry case fits nicely in purse, personal planner or glove compartment. Packaged in a white vinyl case with clear back. Compact case is convenient for travel. And thank you very much for your excellent sale prices and I wish to again thank Veronica for letting me know when you are having these wonderful sales. Logo looks very nice. Did not expect lanyards, so that was a nice addition. the product is just what I wanted and the salesperson - Alicia - was great. they looked great. And, our representative was very helpful in fixing the problem. I am sure they are fine. the packet was really well done. It's pleasure as well to receive our orders earlier than expected. My employees absolutely really likes them.